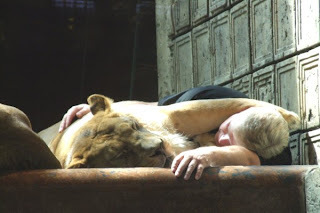 Yes, the above picture is a trainer having a sleep with a lion, taken at the MGM Vegas Lion Habitat, we have just got back from a wonderful holiday in Vegas, rather warm first couple of days, 107 was top temperature,with high wind and low humidity, it was like being in a sauna with the hair dryer on full blast, we were silly to go out in it, to warm for both Keith and I.
and Jersey Boys, the best show of its kind we have ever seen, great story, great music and wonderfully produced, well worth seeing. 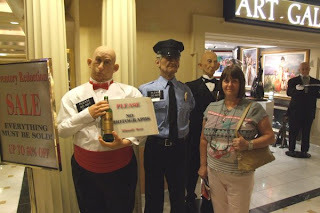 It is back to normal now, doing the washing , going shopping and getting back to making some more mawspaws creations, but Keith wondered if you can spot me amid the old men of Vegas. Very disappointing morning, we have just seen that the blackbirds have given up on their nest, after sitting on the nest for 10 days the eggs have not hatched, so sad news. 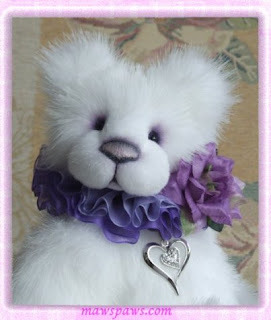 Blanche has just gone onto the new look web site, if you have time to test the site out and email me with your thought, I would be very grateful. 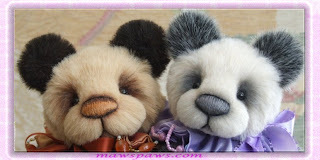 I have just added a couple of new pandas to my web site. Mrs Blackbird is still sitting on her nest, with Mr Blackbird doing a great job protecting her and the eggs.